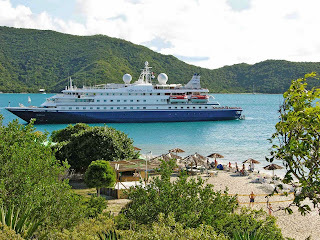 SEADREAM Yacht Club have just the answers for those looking for holiday escapes this coming summer that are laid back, amid a magic and outdoors aura that Australians love – yet are fully 5-star stylish in an exclusive wrapping away from the crowds. Between November this year and April 2015 you could find yourself using SeaDream's complimentary diversity of power and sail water-sports facilities off stunning and often private beaches, enjoying a barbecue lunch with drinks included and hiking, snorkelling and scuba away from the crowds on a private island, or having local oarsmen float you by small boat down a "tunnel of flora and fauna" amid one of the region's most stunning natural getaways. Caribbean sailings start from US$3391pp twin-share for seven days, with prices including award winning cuisine, premium wines and bar drinks, power and sail water-sports, 30-international course golf simulator, state of the art fitness centre, mountain bikes for shore excursions, gratuities and port charges and taxes. THE Nature Isle of Dominica with the chance to use SeaDream's own onboard complimentary Wave-runners, kayaks, stand-up paddleboards and other water-sports facilities off stunning beaches – or being rowed by oarsmen in a small local boat through an aptly-described "tunnel of flora and fauna." NORMAN Island that's a privately-owned 240ha paradise for hiking, snorkelling and scuba diving away from the crowds. ANEGADA in the British Virgin Islands, a paradise of stunningly beautiful, quiet and secluded beaches with amazing snorkelling. TERRE-de-HAUT in the Iles des Saintes often called "one of the most picturesque locales in the world." UNION Island in the Grenadines whose Clifton Harbour has a unique man-made island with a bar offering mountain and National Marine Park views.